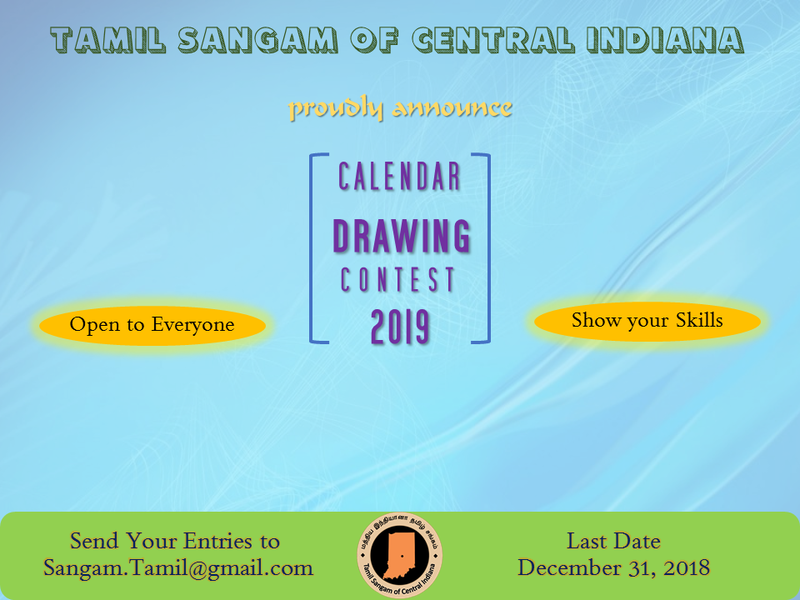 Tamil Sangam of Central Indiana proudly announce Calendar Drawing Contest 2019. As you aware that, TSCI is distributing monthly calendar to all of our members from 2018 onwards. TSCI is preparing and designing 2019 Calendar to distribute to our members. We are looking for best drawings to represent each month. It would be great if each drawing represents Tamil Nadu, India and/or Indiana. Anyone can submit their entries; don't need to be a TSCI member. Drawings can be drawn in drawing sheets or in digital. Drawings should relate with Tamil Nadu, India and/or Indiana for each month. Drawings should NOT relate to any religion, political party, and/or individual. If you are using any pictures in digital art, you must hold the copyrights of those pictures. Each contestent can submit drawing only ONE entry for each month. But, each contestent can submit for all 12 months. However, one contestent have chance to win for only one month of the drawing. Submissions must be received by December 31, 2018. There is no age group limit. Anyone can participate. Do Not write your name in the drawings. Add your name in the email, or back side of the drawing sheet. Do NOT fold your drawing sheet which will void the drawing entry. Drawings must be suitable for printing at 8.5 x 11 inches, which translates to 2550 x 3300 pixels. Entries that do not meet this requirement will be rejected. Drawings must be high resolution (300 ppi). Drawings must be drawn in a horizontal format. Drawings that don't meet the rules and requirements will be rejected. - Please reach out to Sangam.Tamil@Gamil.com. One of our Executive Committee member will contact you to collect the drawing sheet from you. Email your digital art to Sangam.Tamil@Gmail.com with subject "TSCI 2019 Calendar Contest - <NAME> - <MONTH>" like "TSCI 2019 Calendar Contest - Apple Joe - September"
Please note that by entering this contest you are granting Tamil Sangam of Central Indiana, unrestricted, non-exclusive usage of your drawings/digital arts with the understanding that TSCI may also publish your name and may crop, resize, recolor, touch-up, or otherwise edit your drawings. TSCI decision is final.